Putting together a collection of useful and interesting reports related to jade. Known to humans for thousands of years, it is green jade that has always remained the most sought after color for this gemstone. The Chinese accord high respect to jade and are willing to pay big money for fine jade. It is the beauty and attractive luster of polished jade that attracts jewelry lovers across the world. Imperial jade which happens to be finest quality of jade, can be priced in the 1,000 U.S$ to 3,000 U.S$ per carat range. As expected, Imperial jade is natural and is not treated in any way. 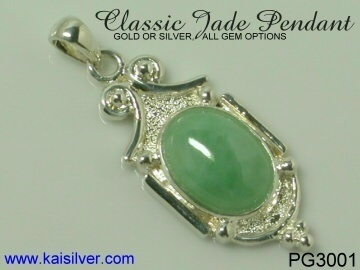 Most jewelers prefer to stock dyed jade to please buyers with awesome green gems at a modest price. 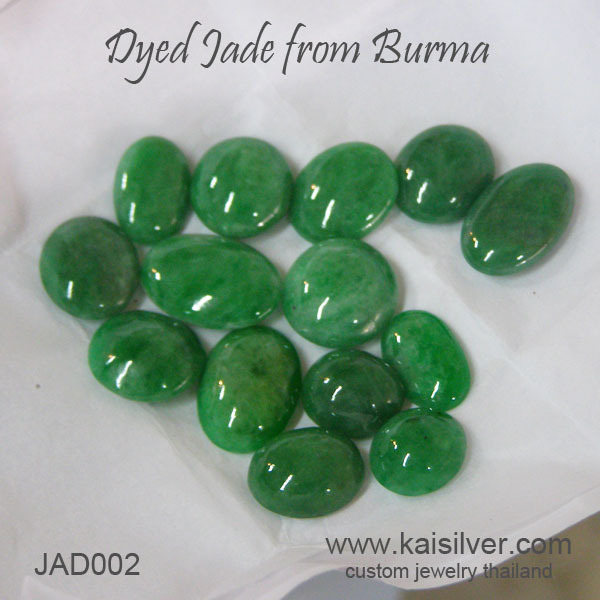 At Kaisilver we specialize in sourcing moderately priced treated and untreated jade from Burma, the idea is to make the gorgeous gem available in a wide range of prices. Having said that, we have the expertise and resources to source the fine Imperial Jade too. Most jewelry buyers are unable to budget for high priced fine jade. With most of the commercially available jade gems being dyed to enhance their color and overall beauty, moderately priced untreated green jade is not easy to find. 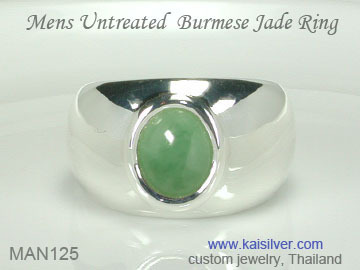 Kaisilver specializes in sourcing affordable jade gems both, treated and untreated from the Burmese mines, read the report and learn all about it ... more. 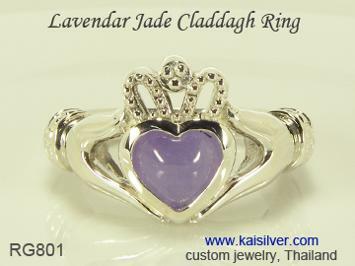 A fine depiction of the four centuries old claddagh ring by the artisans at Kaisilver. 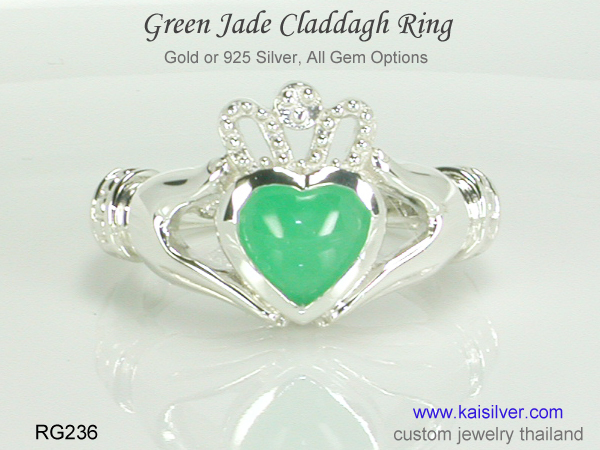 A gold or sterling silver jade claddagh ring, you can choose a green jade or lavender jade gemstone for your ring. The claddagh ring is recognized as one of history's most meaningful jewels, we custom make the ring in all sizes and with all gem options ... more. A gorgeous heart ring with tremendous meaning. The claddagh ring has a history dating back to 4 centuries. We present a natural green jade gemstone set in a finely crafted gold or 925 silver claddagh ring. You can read all about this ring and get details for pricing and options ... more. While we are fully experienced and connected to source the finest Imperial Jade available, few budgets can handle the 1,000 U.S$ to 3,000 U.S$ per carat price range. Our expertise enables us to source affordable natural jade gems in a modest price range, these gems include both untreated and dyed jade. We also make it our duty to inform buyers about what jade they are getting, no secrets and no smart sales hype ... more. The color and toughness of jade makes it ideally suited for men's rings. We offer men's jade gemstone rings with your choice of design, you can choose an affordable untreated gem or request for a jade gemstone that is dyed to enhance its color. Both gold and 925 silver men's jade rings have good workmanship and handpicked gems ... more.